its a simple tool that can take a backup of your current POL accounts SETUP and save it in a profile ( up to 4) that you can restore again later. I am working on removing some of the click steps. buts its gonna take a bit of work. Also at start will asked for location of the game/windows and autolaunch it when loading a profile. it appears the difference between save & load was confusing some people. Next version will have a security check to prevent people from loading a non existing profile (empty). Thats cool. Right now I just swap bins. Basically the same thing just clicking instead of drag and drop. Just a word to anyone doing it, CREATE BACKUPS! if you accidentally leave a pol open with "file 1" and then swap and open a pol with "file 2" you corrupt the ***out if it lol. Thank you for the "suggestion"
is this a standalone thing elsewhere? Not sure why you'd add 4 fixed buttons, it's just swapping out the same .bin everyone already uses. Should allow user to input names for each set of accounts for easy save/load. Still takes longer than using a bin/bat setup, though. Might be more helpful as a setup tool that generates a batch file, then user can just click batch file they want instead of having to open an app. Does this come with free bots? Need to purchase Guildwork™ Premium® for that privilage. Customization of the backup of the login .bin might come later. Isn't windower able to bypass this already or could? Maybe I'm thinking of something else. And probably eventually streamline the process so that its faster than manually draging and dropping. You can already streamline it faster than manually dragging and dropping. 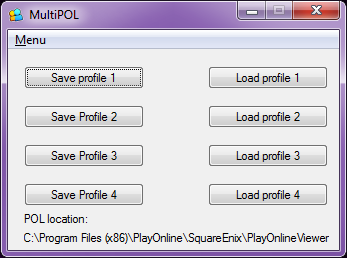 copy "C:\Program Files (x86)\PlayOnline\SquareEnix\PlayOnlineViewer\usr\all\Melee.bin" "C:\Program Files (x86)\PlayOnline\SquareEnix\PlayOnlineViewer\usr\all\login_w.bin"
Drop this into a notepad file, save as Melee.bat (make sure it matches your path to playonline folder, edit Melee.bin to whatever your bin is named). Double click. New bin is in place and you can log in, as good as instant. Save it straight to your desktop or start menu if you want, right next to where windower/ashita is. Not VB and was unaware of your batch script. This came from a request in a discord channel. Bypassing the annoying pol login procedure or the 4 accunt limitation ? is ther a way to have 1 polls installed so you gahave qucik acces to 8 accounts rather than just 4 ? 4 accounts at once...please keep in mind this is for novelty purposes only...if a couple of people use it for botting mercing etc...I can't be held responsible. I read it on bluegartr. I remember a while back someone said the Windower team at one point had the ability to bypass POL completely, but to prevent SE from turning into an exploding beehive. They decided to opt out of implementing the idea. Any kosher to that, or just hearsay? I believe you're talking about Project XI. Just tried to find the link but it seems the site is broken (their forums seem to be the culprit). Im thinking they are using the macro way of logging in which is What I would be messing with as well. New version now autodetects version of PlayOnline. DO NOT USE THIS UNTIL YOU READ HIS SUBSEQUENT POSTS!! This completely deleted my 4 POL accounts. Luckily I had a backup but I attempted to use this tool before reading the thread. I am the example of what not to do. I should have read through before using this and just setup a batch file on my own. It is nice that he created this but its much easier to do what CAMB stated. Create the batch and save it to desktop. Done. Please add your fourth post to your OP so this doesn't happen to anyone else or add a readme.